Dude — I am so with you. I couldn’t give a crap anymore about the dismissive rabble. Later & whatever. I’ve got Landon & Clint & Timmy the whole USMNT and the World Cup every 4 years and the EPL & La Liga 10 months of every year and if they don’t get it I don’t give a flying F anymore. I’m on vacation on Fripp Island SC and drove 90 minutes into Savannah to watch the match at Churchill’s Bar with My People and a lot of English and when Landon nailed his goal that place exploded. I reared back let out a primal scream like I’ve never done in my life. It was that awesome a moment and I’ll never forget till the day that I die. 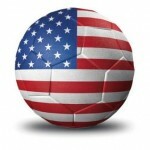 >>But watching this U.S. team in this World Cup, would you bet against them?<< I would now. Have said it before ... and not to hate after the fact ... but Tim Howard has deficiencies. Deficiencies not seen in Brad Guzan. Previous Previous post: World Cup Hurting Movie Biz?